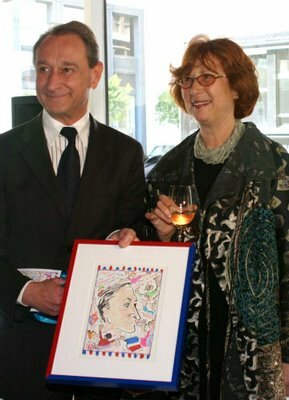 On Thursday, April 20, 2006, The Honorable Bertrand Delanoë, Mayor of Paris, visited Academy of Art University to tour the School of Fashion where he addressed students and invited them to work on his “sense of style” as well as to his City of Paris. Following the tour, President of Academy of Art University Dr. Elisa Stephens and Executive Director of Fashion Gladys Perint Palmer hosted a luncheon in his honor at The Gallery, 79 New Montgomery Street. Gladys Perint Palmer introduces the Honorable Bertrand Delanoe Mayor of Paris to our French Exchange Scholarship Program students Dorothee Flores and Maud Rousseau. BFA Fashion Design student Anna Arguello, who was awarded a scholarship to study in Paris the year before and interned at Risto Bimbloski, shows the Honorable Bertrand Delanoe, Mayor of Paris, one of her designs. 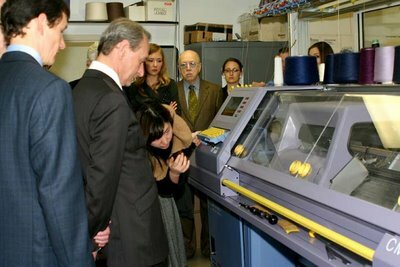 BFA Textile Design student Tracy Hiner, who was awarded a scholarship to study in Paris the year before and interned with Dice Kayek, shows the Honorable Bertrand Delanoe, Mayor of Paris, the Textile Lab. One of the Stoll machines in the Knitwear Studio. One of the Drawing Studios. Many showed their support by attending including the 41st Mayor of San Francisco Willie Lewis Brown Jr.; celebrated author Danielle Steel; Emily Sano, Director of Asian Art Museum; Glenn McCoy, Director of San Francisco Ballet; French Consul General Frederic Desagneaux; Barnaby Palmer, Artistic Director & Conductor of San Francisco Lyric Opera; Sherry Young, Executive Director of African-American Shakespeare; David Humphrey the General Director of PALM; Craig Newmark of Craigslist.com; and two of our upcoming May 24th School of Fashion Graduation Fashion Show honorees, Robert Mettler, Chairman & CEO of Macy’s West, and Wilkes Bashford. 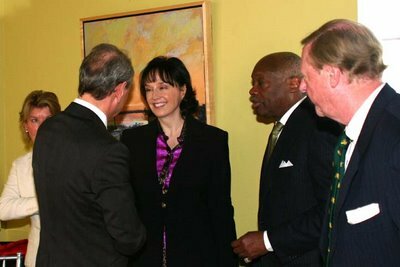 Meeting Dr. Elisa Stephens and Former San Francisco Mayor Willie Brown. 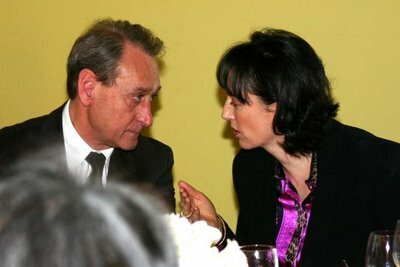 The Honorable Bertrand Delanoe, Mayor of Paris, and Dr. Elisa Stephens. With Dorothee Flores and Maud Rousseau. Academy of Art University currently has the privilege of hosting two students from Paris, Dorothée Flores from Studio Berçot and Maud Rousseau from L’Ecole de la Chambre Syndicale de la Couture Parisienne. “I consider myself very lucky to be at Academy of Art University in San Francisco,” says Dorothée Flores. “It’s an amazing university with advanced technical equipment and facilities and has overall been a great experience as the professors take their time with the students so we can understand everything. They are patient, professional and push the students to progress every time.” President Dr. Elisa Stephens has awarded these two students a Presidential Scholarship to stay on at Academy of Art University for another year. Since 1998, Academy of Art University has been involved with The Sister City Scholarship Exchange with Studio Berçot and L’Ecole de la Chambre Syndicale de la Couture Parisienne, two of the best fashion schools in Paris. 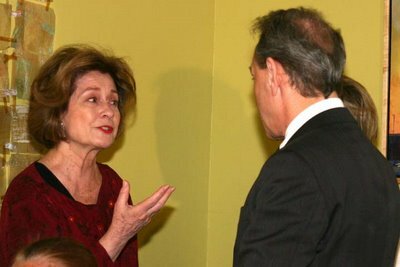 Gladys Perint Palmer began this exchange at the suggestion of then San Francisco Mayor Willie Lewis Brown Jr., and the program has been flourishing ever since with Academy of Art University students going to Paris for one full year and students from both Studio Berçot and L’Ecole de la Chambre Syndicale de la Couture Parisienne attending Academy of Art University. This year’s Academy of Art University scholarship recipients are Lene Anderson, BFA Fashion & Knitwear Design, who is studying at the Studio Berçot and interning as a knitwear designer for Chloe; and Kristian Arvelin, MFA Fashion Design, who is studying at L’Ecole de la Chambre Syndicale de la Couture Parisienne. Past Academy of Art University graduates and recipients of the exchange scholarship include Desanka Fasiska who now has her own line Desanka showing in Los Angeles during Mercedes Benz Fashion Week; Bote Benchekarn, now menswear buyer for Club 21 in Thailand; Nelson Cantada, designer for BCBG; Oh-Young Kwon, designer for Martine Sitbon, and Alisa Schulhoff, designer for Martin Margiela. While in Paris, students have interned with Azzedine Alaïa, Christian Lacroix, Kenzo, Christian Dior, and Givenchy. Gladys Perint Palmer presents him with one of her illustrations. Meeting Diane Baker, Director of Motion Picture and Television. 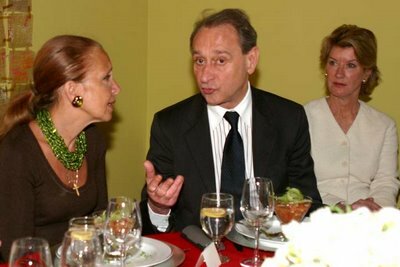 Author Danielle Steel and The Honorable Bertrand Delanoe, Mayor of Paris. The Honorable Bertrand Delanoë, Mayor of Paris, was elected in 2001, becoming the first left wing mayor of the French Capital in more than a century. He is most beloved for his development of high-profile arts and social events, his honesty and devotion to the city as evidenced in his successful drive to stamp out corruption in City Hall, his ongoing reforms of the Parisian transport system, and his raising of the international profile of Paris, including the Olympic bid. Two of his most famous arts and social events are La Nuit Blanche and Paris Plage bring in millions of visitors each year. He can also be found front row at many fashion shows and is highly respected as the first openly gay official in Paris. Gladys Perint Palmer first met the mayor, and deputy mayor, Christophe Girard, at Jean Paul Gaultier – and they were remarkably good-natured about her large coat that took up more than her share of the chair and smothered them. On May 24th at the School of Fashion Graduation Fashion Show, Christophe Girard, Deputy Mayor of Paris responsible for culture and Director of Fashion Strategy at the Louis Vuitton Moët Hennesy Fashion Group, will receive an honorary doctorate degree from Dr. Elisa Stephens and visit the School of Fashion. M. Girard was an official at Yves St. Laurent, is a producer of award-winning documentaries, a tireless AIDS activist and Greenpeace member, and lived in our beloved city of San Francisco in 1977.